BILOXI, Miss. (AP) — A funeral is set for a U.S. Army soldier who died in a North Korean prison camp nearly 68 years ago. OMAHA, Neb. (AP) — A jury has convicted an Omaha man of first-degree murder in the 2018 death of a U.S. Army soldier who was visiting Omaha relatives for the holidays. PHOENIX (AP) — Sen. Martha McSally is urging the U.S. Army to keep protecting Fort Huachuca's role in southeast Arizona as an important training site for drones. BOURNE, Mass. (AP) — The U.S. Army Corps of Engineers says the Bourne Bridge will be down to two lanes as repair work expected to last into late May begins. FAIRBANKS, Alaska (AP) — Medical experts will go to the Fort Wainwright Army post in Fairbanks to study suicide. 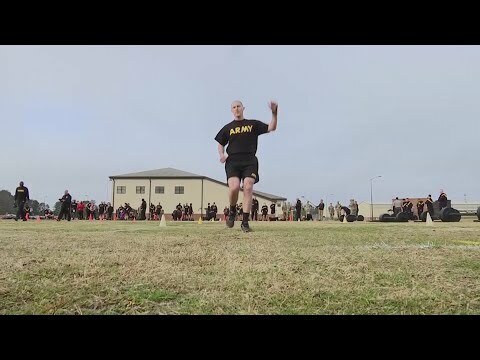 FORT CAMPBELL, Ky. (AP) — Fort Campbell is surveying soldiers, family members, Army civilians and military retirees about the health and readiness of their military community. RICHMOND, Va. (AP) — A panel of female military veterans will discuss their experiences on the battlefield to mark Virginia Women Veterans Week. KINGSTON, Tenn. (AP) — Roughly 75 years ago, U.S. Army soldier Frank Delaney was killed in a foxhole during a fierce artillery battle in Germany during World War II. Today is Monday, March 11, the 70th day of 2019. There are 295 days left in the year. OMAHA, Neb. (AP) — A man has been convicted in the Omaha road-rage killing of a U.S. Army veteran who served in Iraq. TUCSON, Ariz. (AP) — The U.S. Army Corps of Engineers says it will issue a permit authorizing construction of a $2 billion copper mine in southern Arizona by a Canadian company. HARTFORD, Conn. (AP) — About 120 members of the Connecticut Army National Guard are preparing to deploy to Guantanamo Bay, Cuba, to serve for a year at the U.S. military detention center. AUGUSTA, Ga. (AP) — Those interested in the U.S. Army Corps of Engineers' plan for the New Savannah Bluff Lock and Dam are getting more time to comment on the project. ROWENA, Ky. (AP) — The Wolf Creek Dam near Kentucky's Lake Cumberland is functioning normally, despite record rainfall and pressure from the swollen lake. LITTLETON, N.H. (AP) — A new military recruiting center will be opening in northern New Hampshire. WATERLOO, Iowa (AP) — A Cedar Falls couple continues to hold a donation drive for residents of the Iowa Veterans Home in memory of their son killed in Afghanistan in 2007. For more than a decade, Kandie and Brad Vaughn have put on their annual "Shower of Gifts" of toiletries and other necessary items for residents of the Iowa Veterans Home in Marshalltown. Kandie Vaughn, stepmother of U.S. Army Spc. Travis Vaughn, and her husband, Brad, hold the drive to honor the legacy of Travis Vaughn. NEW ORLEANS (AP) — An environmental group has filed a lawsuit against the U.S. Army Corps of Engineers over records related to a planned $9.4 billion plastics plant in rural Louisiana. RUTLAND, Vt. (AP) — A Vermont GE Aviation facility is going to benefit from a $517 million contract from the U.S. Army to build parts for Blackhawk and Apache helicopter test engines. GE Aviation's Dave Wilson tells the Rutland Herald that the GE Aviation plant in Rutland will build some of the key components for the engine.